One of the defining features of the Vibiemme Super is its 2.7 liter boiler. When compared to most other E61 machines, it packs the boiler with an extra 1.2 liters of steam! The steam wand is affixed to the left side of the machine via a ball joint. That allows you to move the steam wand in any direction needed. The wand itself appears to be slightly larger than most in diameter. I would have to take my calipers to it to compare it with my Isomac. The wand has a small rubber grip point for moving while hot. Just don't miss, or you will be reminded when you sizzle a couple fingers. The Domobar Super steams like a rocket. It will easily whip up 8 ounces of milk to a perfect microfoam. Smaller amounts of milk will steam nicely but may be a challenge for the first time user. You can retrofit the steam wand with a single hole tip or feather in the steam power by using small adjustments on the steam valve knob. You could also lower the boiler pressure to produce less steam but why? One of the defining features of the Domobar Super is its steaming power. Start with an ice cold pitcher and milk. I keep my pitcher in the freezer until needed. Use the correct sized pitcher for the volume of milk to be steamed. I use a pitcher that has approximately twice the capacity of what I am frothing. Six ounces of milk gets a 12 ounce pitcher, 12 ounces of milk gets a 24 ounce pitcher. Failure to abide by this simple rule could result in a milk decorated kitchen or very happy pets when you overflow the pitcher and splash hot milk on your feet. With small amounts of milk (6 ounces or less) angle the steam wand straight down and hold the pitcher level. Purge condensation from the steam wand, place it one half-inch deep in the center of the pitcher, and then open the steam valve one turn. There is no need to surf the steam tip on the surface of the milk; if you try, you will end up with big bubbles, not microfoam. Be ready, the milk will heat very fast, so you need to be quick on the steam valve to stop in time. If you are using a thermometer you will want to stop about 10°F short of your target. The Vibiemme steams so quickly that the thermometer will lag behind by several seconds. For larger amounts of milk, start with the wand at a 45 degree angle to the pitcher and positioned to the rear two thirds of the pitcher. Again submerge the tip a half inch. Open the valve a full turn or more to start the action. With 12 ounces or more you will need to surf the steam tip on the surface of the milk to develop the microfoam. Gently lower the pitcher until you get that pffffft-pssfffssfffft sound. 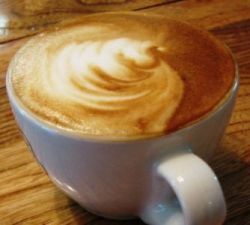 Once the milk has increased in volume by at least one-quarter (any less and you are making steamed milk, which is not necessarily a bad thing depending on what drink you are trying to make) and the temperature increased to 80-90°F, plunge the tip an inch below the surface of the milk. Move the pitcher forward until the steam tip is in the front two thirds of the pitcher and just be still. It takes a couple of seconds for the milk to start rolling. Continue to steam until the temperature is 10°F short of you target and turn off the steam. Admittedly the steps above sound more difficult that it is. To make life a little easier, you may want to watch the video to the right. As you can see in the steaming performance video above, the Super has formidable steaming capacity. If your forte is milk based drinks, or you occasionally entertain and produce multiple milk drinks, the Vibiemme Domobar Super will not disappoint.